(Phys.org)—Polyamines are widespread and important organic compounds involved in multiple cellular processes in living organisms. Their levels are highly regulated through a combination of processes including synthesis, breakdown and transport. However, the mechanisms of polyamine transport are still largely unknown. Since the widely used herbicide paraquat (methyl viologen) follows the same transport pathways as polyamines, Miki Fujita and colleagues at the RIKEN Plant Science Center in Tsukuba, Japan, analyzed natural variability in paraquat susceptibility in the model plant Arabidopsis thaliana. They found that the gene resistance to methyl viologen 1 (RMV1) is involved in the transport of both paraquat and polyamines in Arabidopsis. Paraquat's herbicidal activity results from causing oxidative stress in plant tissues. However, Fujita and her team found that most paraquat-tolerant varieties of Arabidopsis remained susceptible to other oxidative stress inducers, implying tolerance was due to reduced uptake rather than limitation of paraquat's oxidative effects. By crossing different paraquat-resistant varieties, they showed that paraquat-tolerance was linked to a single locus, while cloning and complementation techniques revealed its genomic location. 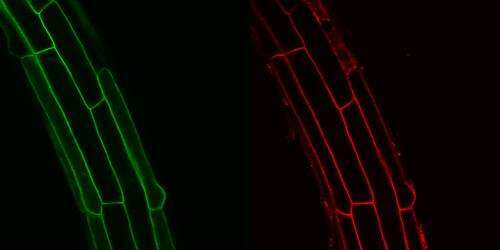 Using transgenic plants in which they had placed the fluorescent jellyfish protein, green fluorescent protein (GFP), under the same genetic control as RMV1, the researchers revealed that its expression is localized to the cell membrane, indicating a likely role in uptake or transport of molecules into cells. Fujita and colleagues then verified that RMV1 mediates paraquat uptake by studying Arabidopsis plants in which RMV1 is inactivated by mutation: these plants showed higher paraquat tolerance, indicating reduced paraquat uptake or transport. Many of these mutants also showed increased tolerance to certain polyamines, indicating that the same locus is involved in polyamine transport. However this effect was relatively slight, suggesting to Fujita and her team that other polyamine transporter genes might exist in the Arabidopsis genome. Fujita is now aiming to identify other polyamine transporters and investigate their biological significance in terms of plant growth and stress responses. The identification of such transporters may facilitate developments in fields as diverse as cancer treatments—reduced polyamine uptake is linked to the efficacy of certain anticancer drugs—and GM crops. "It is really urgent to create the next generation of herbicide-resistant crops," Fujita says. Some hurdles remain, however: paraquat is banned in many countries due to its toxicity, but these findings are a step towards creating more environmentally friendly herbicide-resistant crops.